Hair extensions can transform any style. They make hair look fuller and can add unique color. That’s why so many celebrities use them. Hollywood stars, musicians, singers, and other famous figures need to stand out. Getting noticed is part of their career. Who is putting in not-so-natural locks to give their real strands a beauty boost? Jennifer Lopez is known for her stunning look. She favors shades of brown. While her color choice may feature organic tones, she often wears hair extensions. Rather than making them noticeable, her stylist works them into her natural strands with color that looks like she grew it herself. Take a close look because it’s difficult to tell where her real hair ends and the extensions begin. Selena Gomez diversifies her gorgeous look with hair extensions. Her stylist Marissa Marino applies long, wavy lengths that extend well past her shoulders. It’s a look that is captivating on the red carpet. While the finished ‘do looks natural, it’s easy to tell that she didn’t go from a bob to long in a week. Ariana Grande is known for her showstopping hairstyles. She once rocked a half up, half down look but has changed things up with hair extensions. Her ultra-long extended look appears in the music video for Everyday featuring Future. Cosmo also captured the celeb with that same luxurious mane pulled up high on her head in a sleek ponytail. There was some controversy when she switched to a lower version, but Grande later commented that the high ponytail was causing discomfort due to how tightly it was pulled up. Beyoncé has made a name for herself as one of the most powerful celebs around. She’s an icon of fashion and always looks breathtaking. There is no doubt that her natural strands are fabulous, but as a performer, sometimes you need more. She accentuates her look with professionally applied hair extensions that add the height and bounce fans adore. Some celebs stick to a look that becomes their trademark. Rihanna has a different approach. She often reinvents herself, showing up in a new look at each performance. She’s a true trendsetter who isn’t afraid to explore. Her hair extension repertoire includes long strands as well as bold colors and ombres. Sports Illustrated Swimsuit model, actress, and producer Chrissy Teigen is very upfront about her style choices. Her hair always looks fabulous, but she revealed a secret on Instagram back in 2015: “All this hair?! Nottttttt all mine!”. She encouraged followers to check out her “hair genius” Priscilla Valles. Canadian-Filipino model and actress Shay Mitchell shares Teigen’s sentiment about Priscilla Valles. She was spotted on Instagram sporting long, luxurious wave extensions while floating poolside in a pink flamingo. Lady Gaga burst onto the scene with some of the most exciting and unusual attire fans have ever laid eyes on. She’s known for her dramatic flair and surreal fashion. Hair extensions have become a part of her wardrobe as well. They give her more ways to create with wild colors like green, yellow, turquoise and more. She uses them the same way a traditional artist uses a brush and paint. Whether you love her or hate her, there is no denying her creativity when it comes to personal style. Many celebrities use hair extensions to experiment with their look. Katy Perry falls into that category. The pop singer chose unusual hues to add fabulous color to her dark locks. Rainbow hair extensions were applied so that she could achieve an amazing look without dying her real strands. If you watched Modern Family, then you know Sarah Hyland as Haley. She’s petite and youthful, which allows her to play a teenager despite being older than the character she portrays. She posted a photo online that showed her getting extensions put in. Her real hair is significantly shorter than what most people expect. Anyone with interest in modeling has heard the name Tyra Banks. She’s been in the business for years. Her elegant look includes gorgeous brown locks that are pure perfection alongside her stunning skin tone. She has changed things up over the years, switching from curls to straight. Extensions have helped her maintain a captivating, voluminous look that turns heads on the runway. You don’t have to be a celebrity to get a ‘do worthy of Hollywood. A professional stylist can help you achieve a style you love. 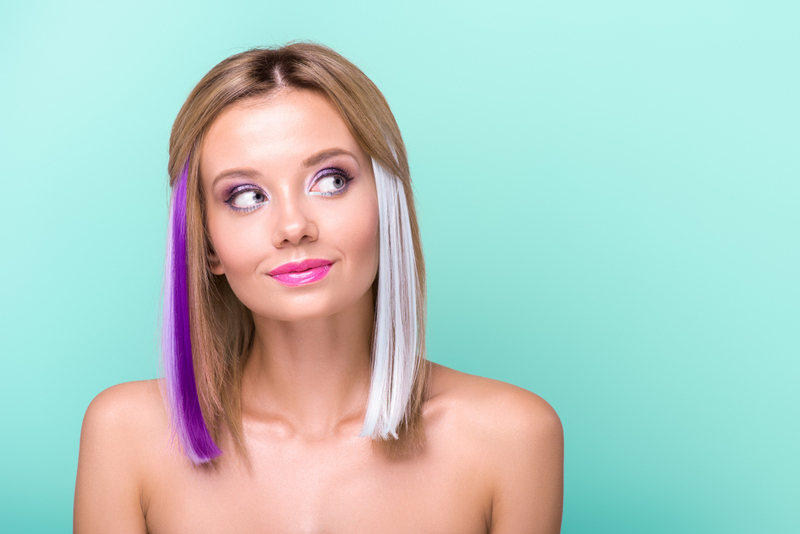 Contact Tiffany Taylor today to learn more about how hair extensions can boost your look.